That’s what 3-year-old Ariana of Winterport, Maine, said when her father Josh Smith asked where her donated hair was going to go. It was then that the dad of two realized his toddler had a heart that was too big for words. When their daughter showed curiosity, Smith and his wife Crystal explained how medicine was what made the child in the video lose her hair. The Smiths chose “Locks of Love” to send Ariana’s generous gift to a child with medical hair loss. 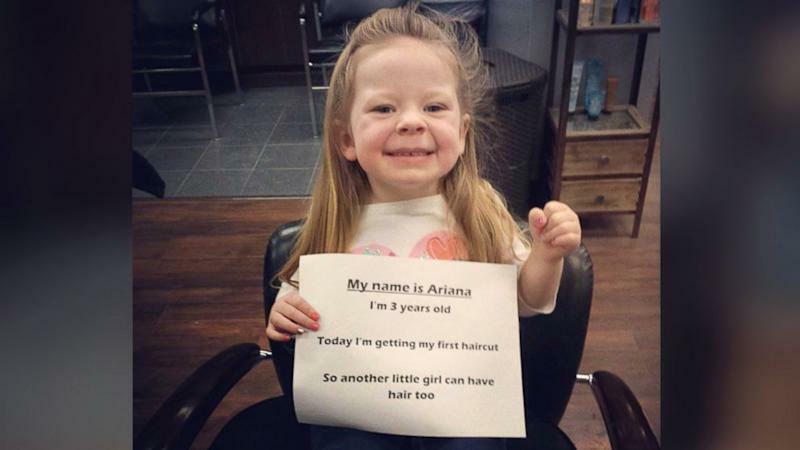 A week later, Ariana was taken to the family hairdresser where 10 inches was cut from her hair. “It was her first haircut,” Smith told ABC News. “She could be so selfless like that. Her first reaction is ‘How about I give up something that I have so a little girl can feel pretty'. Smith posted his daughter's moving gesture on his Imgur page, where it's received almost 645,000 views in just two days.